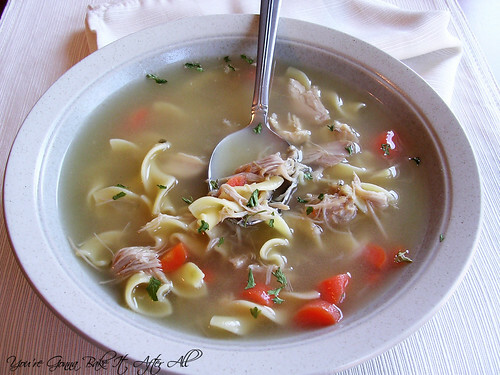 Turkey soup is one of my favorite winter meals. It just screams cold weather to me, and nothing is as warm and comforting as a big bowl of this soup. Whether you come down with a bad cold virus or come in from a day of playing in the snow, this soup is the perfect remedy. 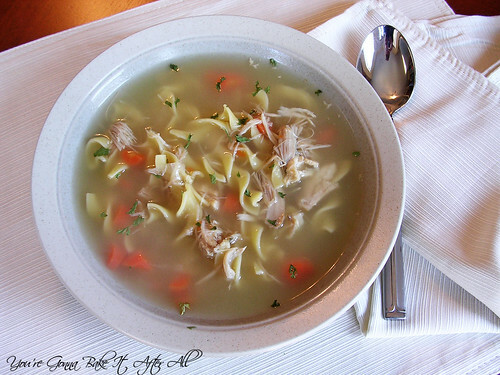 After hosting our first Thanksgiving, I was completely wiped out and the thought of making turkey soup was too daunting to tackle, but I absolutely could not give up the opportunity to make my beloved turkey soup. I threw the turkey carcass in the freezer and saved it for another day. On one of my days off after Christmas, I invited my mom over to teach me how to make her turkey soup. She doesn't have a written recipe, so I tried to document what we did along the way. Much of this recipe is adaptable to your personal taste; put in what you like! I like to just make enough of the soup with noodles for one meal to avoid the noodles getting overly soft. I love the texture of al dente wide egg noodles in this soup. Cooking the noodles in the soup itself gives them a fantastic flavor, adds a little starch to the broth, and omits the use of an extra pot - added bonus! As I mentioned earlier this week, it may be March but I'm not convinced the winter weather is behind us, so there are plenty more turkey soup days left! 1. Make the stock: In a 10-quart stock pot, heat the oil over medium heat. Add the carrots, onions, celery, salt, and pepper. Cook until vegetables are softened slightly. 2. Add the turkey parts and fill the pot to the top with water. Heat to a simmer, then reduce heat to maintain a simmer for approximately 2 hours or more. 3. Using a fine-mesh strainer set over a large bowl, pour the stock into the strainer to remove vegetables and turkey parts. Return the stock to the pot and set aside. 4. 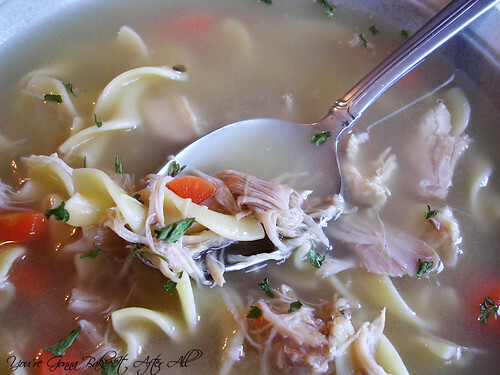 Assemble the soup: Carefully pick through the stock solids/turkey parts to remove the turkey meat. Add it back to the stock. At this point, add any other veggies you would like in your soup (I added a little yellow onion and some carrots). Season to taste with poultry seasoning, thyme, parsley, salt, and/or pepper. If the stock lacks a bold poultry flavor, you may add some chicken bouillon to bump it up (I did not have to do this). 5. Return pot containing soup to a burner and heat to a simmer until veggies are cooked through. Remove the pot from heat, let cool slightly, then place in refrigerator. The fat will rise to the top of the soup and can be skimmed off later. 6. Finish the soup: When ready to eat the soup, make sure fat has been skimmed off, add as much soup as you'd like to a pot and heat to a boil, add dry egg noodles and cook until al dente. Taste to make sure seasoning is to your liking, and serve soup immediately. The longer the soup sits, the softer the noodles will be.